Taking a philosophical approach to scientific research might be seen as anthropomorphizing other species. I would agree it is wrong to attribute human characteristics to animals just as it’s wrong to expect a cat to behave like a squirrel, or vice versa. But the charge of anthropomorphizing frequently comes with the assumption that human consciousness is not just different, but fundamentally superior to all other animals. Clearly the human animal is a unique species with a unique understanding of the world, but not because human consciousness has any ‘X-factor’. I believe our uniqueness comes from the combination of ‘modules’ of consciousness – language, reason, self-awareness, meta tool use etc, which can be found in other species to greater or lesser degrees. Combined with our physiology (the ability to lose heat for example) this gave our species a unique evolutionary opportunity. The historical assumption that our species is isolated at the top of the Evolutionary tree and ‘a breed apart’ is being challenged by recent experiments. It is a change that is long overdue to reduce the suffering we inflict on other animals. But also because recognizing what we have in common with other animals could lead us to a deeper understanding of our own consciousness. I should add that beyond signing online petitions, buying leaping bunny toiletries and sharing stories of particularly shocking cruelty to animals on social media, I’m not involved in campaigning for animal rights. I have never been a vegan and although I was vegetarian for 15 years I now eat some meat, avoiding factory farmed. In the long Ice Age that ended about 120,000 years ago, the total human population may have dropped as low as thousands or even hundreds, bringing humans close to extinction in a hostile world we didn’t control. But when the climate improved our intelligence and adaptability gave us the ability to thrive by shaping the planet to suit us. We’ve long known we’re not the only intelligent animals on our planet, but as animals have limited ways of communicating their experience to us measuring animal intelligence is always going to involve a degree of supposition. So how can we properly assess intelligence in other species? Large brains suggest intelligence but more reliable indicators must take account of brain to body ratios, as larger animals need larger nervous systems to control their muscles and organs. An adult horse has a brain of about 0.5kg compared to an adult human brain at 1.4kg. But the ratio of brain to spinal cord is 2.5 to 1 in a horse, about 50 to 1 in humans, giving a possible index for relative intelligence between species. 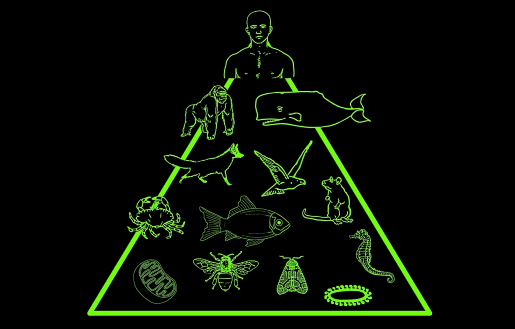 The ratios in other species might form an interesting hierarchy of intelligence. Bottlenose dolphins are at 40:1. Cats are fairly clever at 5:1 and unsurprisingly our closest ancestors the apes more so at 8:1. The relative composition of human and animal brains is another possible measure. In humans the cerebral cortex – the gray matter – is associated with thought, problem solving, planning, emotion, speech and memory – those ‘higher functions’ of consciousness which make us human. Although we have a larger brain to spinal cord ratio than a bottlenose dolphin, the bottlenose has proportionately more cerebral cortex than us. The dolphin form is so well suited to life in the oceans, unlike humans, significant parts of the dolphin brain are not required to shape and change its environment to ensure survival. We are certainly the dominant species on the planet. Does it then follow our ability to make tools and shape the world, makes us superior? Or is it a requirement for our species’ survival that might hold back our consciousness in other ways? Regardless of behavioural observations, it seems reasonable to assume that another large brained social mammal with plenty of cerebral cortex might have an equally rich inner life to our own. Any predictive method for intelligence might also carry a risk of human bias. The brain to body mass ratio is another way to rank species. But humans don’t top the table here. A more sophisticated variant the encephalization quotient adjusts brain to body mass for the expected characteristics of types of species i.e the environmental requirements of a rodent’s body are significantly different from a marine mammal’s, so it’s reasonable for the ratio to take that into account. Interestingly this adjusted version puts humans up top again. Although I am not debating whether the encephalization quotient is correctly formulated, I think it’s worth considering that in developing and refining any such formula there could be an implicit assumption humans are the most intelligent species – and therefore we assume we have the formula right if humans come out on top when we crunch the numbers! Does the traditional hierarchy of consciousness always apply? Tables and rankings are interesting. But an IQ test does not necessarily tell you who has the greatest intelligence – it tells you who scores highest on an IQ test. For survival all animals must be able to tell the difference between a small pile of food and a large one. Yet the assumption has long been only humans can abstract such tasks into mathematical abilities. How old were you when you learned to count? Chickens do it without tuition at just 3 days old. There are several examples of animals mathematical abilities in this BBC article. 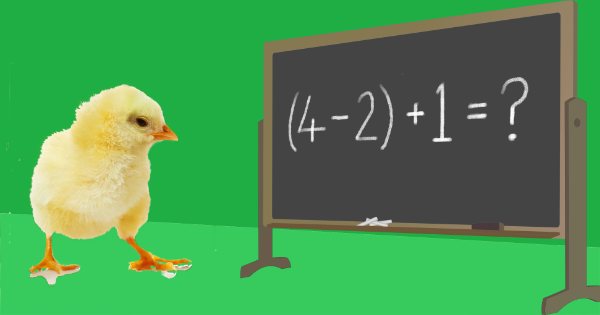 Not only can chicks count, they’ll do subtractions with an 80% success rate. They are not the only mathematical birds. A key step in human civilisation was the use of zero – the number that isn’t a number. Our technological age is virtually unthinkable without zero and it requires a conceptual shift that toddlers rarely get until around 3 years old. Yet apparently Alex the African Gray Parrot wasn’t feeling challenged enough by his human tester so introduced it into his exercises one day. Still in the Avian kingdom, pigeons are very good at pattern recognition, which is understandable given their fantastic navigational skills. More specifically as described in a previous post, pigeons are better than humans at grasping The Monty Hall problem – a probability conundrum that took some very clever people years to understand. In this man vs pigeon battle most people struggle to grasp what’s happening and make the switch to the most successful strategy, yet the pigeons recognize the pattern and use the best strategy over 95% of the time. Now, it is tempting to excuse our relatively poor performance in the Monty Hall experiment by bringing in other factors – perhaps make the argument “but a human subject’s reason might be affected by the desire to succeed in front of an authority figure…” or something similar. That is potentially to downgrade the pigeons’ good performance to the work of a small feathered computer. How human complexity hinders our reasoning is worth considering, but looking purely at results, the fact is pigeons still win that contest hands (and feathers) down. Over emphasising human complexity could further reveal a double standard. Consider the monkey trap where the monkey reaches through a small hole for some bait, then stays trapped because holding the bait his hand is too big to escape back through the hole. The story is often quoted as an allegory for the need to ‘let go’, although there is this filmed example. A frequent interpretation is that the monkey has been trapped by his failure of reason, so is another example of human superiority. We do not assume the monkey has additional layers of complex consciousness, hampering reason, and stopping it doing what is obvious to us and dropping the bait. So should we use complexity as an excuse in one species and not in another? Having been beaten in a probability test by pigeons, too much explaining away poor human performance might just be evidence that humans are sore losers. One area getting increasing attention is how much of their world animals might abstract. A basic test of abstraction is the mirror test – can an animal recognize itself in a mirror, maybe by trying to remove a paint mark they could not otherwise have known was there? This suggests self-awareness, and is a test humans only pass from around two years old. There are a number of animals that have passed the mirror test; unsurprisingly the list includes known intelligent mammals the great apes, Orcas, dolphins, an Asian elephant called Happy, but also Eurasian magpies – and strangely in one study even ants. In fact other animals may be recognizing their own image without passing our test because they are not responding to their reflection in ways that we expect. For example gorillas used to get a fail, but we now understand they are probably reluctant to look in mirrors as eye contact signals aggression in Gorilla society. Similar to the mirror test in terms of abstraction, in the 2003 BBC documentary “Dolphins – Deep Thinkers?” David Attenborough gives sign language instructions to a captive dolphin through a video playback on a small monitor rather than in person. The dolphin is not confused by a small 2D image and has no problem recognizing and responding to a video trainer. Problem solving is a good test of abstraction, such as this example of a crow making short work of an eight stage assault course. To get the food he needs the long stick trapped in a see-saw box. To operate the see-saw he needs to drop in three stones from three cages. And to extract the three stones he needs to use the short stick. The crow, named 007, has already demonstrated an ability to problem solve, but has never been tested with so many steps before. He flies in, inspects the boxes, sizes up the problem and has his reward after a few minutes – some people might struggle to get there so quickly. What’s particularly impressive is that there’s very little trial and error here. His actions are clearly guided by learning from previous tests combined with some abstract thinking. If you want to know more about crow intelligence this documentary is well worth a watch. Do animals have true language? Humans have large language centres in our brains and highly flexible vocal tracts. We have writing and printing, and language has been key to our dominance of the planet. Although definitions of language vary, a common requirement is that true language is evidence for, and therefore requires a brain equipped with the ability to abstract. But brains with the capacity for abstraction are not unique to our species. The evidence for animal language is too large a subject to weigh up in a blog post. My feeling is it is considered controversial only in part due to scientific rigour – rather it more than anything else complicates our presumed status at the top of the Evolutionary tree. Take whales and dolphins. It seems reasonable to assume a large brained social mammal, capable in several ways of abstracting its world, which communicates within social groups using a wide range of frequencies and sonic patterns, might have a form of language. Of course it’s not proven because we don’t know what they are saying to each other. Humans use language to share complex information, emotions and concepts to our evolutionary advantage, so wouldn’t it be strange if whales and dolphins did not do the same? Is it even possible the reason we’ve not been able to understand marine mammals so far is their language is far more sophisticated and varied than any language we know? Maybe it even shifts and changes like a computer message being encrypted with a new key every day. Maybe, just maybe, the word for fish or ball is very different for a dolphin on a Tuesday than the word for fish or ball on a Wednesday! That may prove correct in the long term, but can we really know that when inter species communication so far has been fairly simple? Many species will never have the capacity for true language. Yet we should be careful of adding on more criteria to our definition of true language, in order to keep human language in a distinct category from potential animal languages. For example, dogs have relatively poor eyesight so a dogs’ understanding of its world comes partly from its terrific sense of smell (dogs have between 125-300 million olefactory sensors, we have only 5 million). But we do not treat a dog’s sense of smell as being something separate from our own, or reserve a different category for it. We simply regard it as being a more enhanced version of what we have. So although these two apes Koko the Gorilla and Kanzi the Bonobo have limited vocabularies, they can both act according to sentence order, learn new words and invent sentences reflecting wants, emotions and future actions. Their language skills which seem to reflect a fairly sophisticated perception. Societies thrive with co-operation, and society requires members know and adhere to the written or unwritten codes the society operates under. Dutch primatologist Frans De Waal has opened up this field in recent years. His studies show chimpanzees engage in reciprocation behaviour – two males apparently agreeing to move on after a fight. Their society just like human society needs ways for disagreements to be resolved in the interests of the group. This entertaining example of De Waals work shows what happens when you try cheating a capuchin monkey . The monkey clearly expects equal pay for equal labour. If that was all such tests showed we might conclude it’s an animal led by self-interest and clever enough to realise she’s being cheated. But variants of these tests apparently show primates going beyond clever self interest to creating fairness, for example sharing a reward when there is no need. Is this a remarkable discovery, or entirely logical? To me it makes evolutionary sense other social animals might look to even things up in the wider interest of the group’s future harmony, and human society has simply inherited the same underlying rationale. These studies show fairness is not simply a human invention – it is not evidence of our more enlightened state as we moved from animal brutality to civilisation. How many Hollywood courtroom dramas have you seen where the young lawyer fights through corruption, intimidation and institutional apathy to a last minute victory? As the closing music reminds us the emotional journey we’ve taken is resolving to its righteous conclusion, the message is it’s not Tom Cruise (or whoever is playing the lead) who is the winner, but Justice itself. Justice is certainly mythologised in our culture. In fact, when justice is done in our courtrooms, you could argue it is not humanity but an evolutionary mechanism that is the winner. For decades the ‘survival of the fittest’ was one of the few behaviours humans acknowledged as common ground with the rest of the animal kingdom. In 2016 on a BBC radio discussion, I heard an entrepreneur lament that bankers had “not yet recovered their animal spirits” following the 2008 recession. The ruthlessly competitive aspect of Evolution has often been used to justify short-term gains in the financial markets and push for deregulation. The underlying narrative of the Financial world has long been there is a financial ecosystem that must operate unfettered by the law makers, to fulfil its evolutionary purpose in the wider interests of the species. In fact, while competition is vital to evolution and business, fairness and co-operation are equally important in human society across the world – and the human animal can very selective about which we emphasise, depending on the forces shaping our society. Less controversial than language or morality is the idea animals may have culture. Given the same conditions groups of animals develop and pass on different behaviours with no clear evolutionary advantage – for example some Meerkat groups get an early night and rise early, other groups in the same area go to bed late and enjoy a lie-in. In 2001 killer whales were one of the first non-human species recognized to have a distinct culture, after observations of dialects and feeding behaviours from different groups with overlapping ranges in British Columbia. Teaching is closely related to culture. Meerkats teach their young to hunt hazardous prey by starting them off with dead scorpions, then live scorpions with the sting removed, before letting them lose on the live and (potentially) dangerous ones. Cheetah mothers use similarly stepped up training programmes for hunting. But the meerkats appear to be basing their training on the student’s age rather than readiness, and can be tricked into giving a live scorpion to an inexperienced student. In fact rock ants could be considered more sophisticated tutors even than the Meerkats, because when teaching the route to food, the training ant waits for the student to signal it’s ready to move onto the next stage. I may myself once have been the subject of an animal show and tell. I used to live in Dingle on the West coast of Ireland, and swam regularly with the town’s most famous resident, Fungie the wild Bottlenose dolphin. One summer there were reports the local pod had been approaching swimmers along the coast at Minard, so a group of us waited all day, wetsuits and snorkels ready. By late afternoon there was a creeping sense that the reports may have been exaggerated. But then we spotted some movement around a mile out to sea, and more in hope than expectation someone slapped a fin on the water. Within in a minute there were 30 wild dolphins close to the shore, surfacing singly or in twos or threes, and we were zipping up wetsuits and scrabbling for masks to get into the water before they disappeared! For around half an hour the pod interacted with our group. I tried snorkeling below the surface as much as possible to meet the dolphins on their own terms. Often when I dived I found dolphins swimming parallel with me, matching my slow pace for a few seconds, sometimes releasing bubbles from their blow holes in imitation of the bubbles that came out of my snorkel tube (something frequently observed in the wild and captivity). When I surfaced groups of two or three dolphins often surfaced alongside me, making me temporarily a member of the ‘coalitions’ young male dolphins form. Moving in synchronicity is an important part of dolphin social bonding, and we were being included. At one point I dived 20 feet down and flipped on my back to get a overall picture of swimmers and dolphins. Just above my chest two males shot across me diagonally from opposite directions. Near the end I was floating on the surface, watching a mother and her young calf circling on their sides to get a proper look at me 10 feet below. The calf swam close to the mother’s tail and was very young, only a third of the adult length. I had the distinct feeling for all the enjoyment the dolphins appeared to take in the encounter, that maybe watching this human, cumbersome in the water and so relatively harmless, might be part of that young dolphin’s education. Emotions are subjective enough in humans and our knowledge of others’ emotional state is heavily dependent on our ability to communicate, so assessing emotion is animals is extremely difficult. People certainly project emotions onto animals without thinking, but there is sometimes an issue of semantics in describing animal emotions. Is it scientific to say an animal appears content but not joyful or even happy? Is the difference between these words a matter of degree, or a deeper semantic issue because we reserve certain adjectives for human experience only? Happiness means different things to different people. I suspect the idea that only humans can truly experience happiness is linked to a concept of happiness that requires an awareness of the current circumstances of the individual’s life, a strong sense of past and future, a personal history and personal identity. But is your happiness really due to a rational assessment of all the circumstances of your life? I often feel happiest when I forget my wider life circumstances and focus fully on whatever I’m doing at that time. As with faculty for language, without proper communication we can only speculate about an animal’s inner life and infer emotional states from observations. However isn’t it more likely a complex social animal with a degree of self awareness has complex emotions than does not? A few years back I attended a falconry display. Already struggling with the heavy rain, the falconer added that it could be worse – it wasn’t until very recently that he could fly all three hawks together. Initially they had only the male and one female. The two birds got on well and seemed to bond closely. The trouble started when the third, the younger female was introduced. The male preferred spending time with her, something the older female did not appreciate. For two years the birds had to be kept and flown separately, or the older female would attack the other two. Is it anthropomorphic to describe the older female as having been jealous? It seems the most appropriate word. There isn’t any real evolutionary advantage to jealousy in human society. It tends to drive away the object of desire, and likewise it only caused disruption to the hawks. Although humans have made jealousy the subject of stories from Othello to Fatal Attraction, and we can describe what rejection feels like and create a narrative around what the others betrayal has done to us – create a sense of self from that – is that evidence of a different type of emotion, or just an extra layer on top of the same underlying emotion? I think the base emotion is essentially the same in the jealous hawk as the jealous human. Only the layers of interpretation that we add will differ. Burroughs had some very Victorian attitudes to not just animals, but race, class and gender. The Victorian view of nature was mostly sentimental, because although nature needed taming, Victorians regarded it largely as a scenic backdrop to the more complicated human experience. So there was a clear dividing line between the motivations of human and animal behaviour. Jane Goodall broke new ground with her studies of Chimps at the Gombe in Tanzania from the 1970s. They also observed bullying and apparent enjoyment of violence in a brutal civil war between two chimpanzee groups, which partly led to the ‘demonic male’ theory. The chimps had a shocking capability for cruelty, paralleled only by humans – but the levels of violence in the Gombe have not been observed in other chimpanzee populations, so researchers now believe decreasing habitat, the trauma of snaring (1 in 4 of the chimps have been snared in the Gombe) and the researchers’ habit of feeding the chimps have all had a negative impact on the group’s behaviour. The potential for cruelty is likely genetic. Whether cruelty then surfaces is dependent on circumstance. There are however examples of animal cruelty unaffected by human intervention. This film shows a Gray Whale mother and calf pursued to the point of exhaustion for 6 hours by a pod of 15 Orcas. The calf is killed and only the tongue and lower jaw are eaten. The Gray Whale tongue appears to be a killer whale delicacy because the effort of the hunt was simply not worth the calories gained. I suspect that highly intelligent orcas are aware of the suffering they are causing and therefore the hunt could potentially be described as cruel. As a member of a species that has yet to tire of cruelty to its own and other species on an industrial scale, I’m certainly not judging the Orcas. But it raises the issue that if a complex intelligent animal is capable of empathy, yet causes great suffering acting in ways not significant to its own survival – as humans frequently do, and Orcas appear to do in this hunt – is that not cruelty? The assumption of human evolution is that our societies will become more humane over time. But technological and social evolution will not necessarily lead us to being less cruel – for every problem the human race solves we seem to create more, and find reasons to justify our cruelty to one another. Mass communication has lead to increased tribalism and insularity in politics, rather than the sharing of resources to create a ‘global village’ of mutual co-operation. Potential cruelty in animals needs proper research, but creating an artificial boundary between the motivation for our behaviour and other animals both limits our potential to understand our own cruelty and treats other animals as the Victorians did. The important difference is that the human animal is the only species with the tools to inflict cruelty on all species on a massive scale. We also have the tools to communicate and learn from each other over time and distance, giving us the potential to understand how futile that is. In Peter Singer’s 1974 essay “All animals are equal” he shows how prejudice has informed our treatment of animals. Singer points out that during the Victorian era the supposedly outlandish concept of animal rights was even used to mock growing calls for womens’ rights, as there was a commonly held view that women were inferior, or at best were more emotional and unpredictable and so belonged in a ‘separate sphere’ to men. What our perception of animals until recently has in common with the perception of women then, is how much difference has been emphasised instead of commonality. Four years ago I saw a BBC news item that stated scientists had discovered dogs can think. Having been left alone with forbidden food some dogs were more likely to take it, and even act guilty and contrite when the owner returned. The thinking part being the dogs knew this was a different situation from openly disobeying their owner, and acting guilty could be a strategy to reduce potential comeback. On hearing this my immediate reaction was “Any cat, dog or rabbit owner could have told you that!“. Any theory must be tested by experiment of course. But why has it taken until the 21st century for us to decide whether dogs can think was actually worth investigating? What’s notable about the majority of research I’ve described above is how recent these studies are, much of it taking place in this century. And in fact many experiments, on the BBC and Discovery channel, have taken place because they make interesting television, rather than being purely motivated by any great human thirst for knowledge for its own sake. So in our quest to entertain ourselves the human animal is actually making some important discoveries about its true place in the animal kingdom. Perhaps more experiments into animal intelligence and behaviour will de-mystify our own consciousness. They may lead to better treatment of other animals and remind us we are a product of the natural world, and our survival is now entirely dependent on a healthy planet. Finding common ground with other animals should be understood as knowledge that enriches our understanding of intelligent consciousness, without devaluing the human experience. ess, without devaluing the human experience. All comments are moderated before appearing.